The mob is an intrinsic part of society, a permanent moral underclass. Mobilized into action by appeals to the basest human instincts, it spreads destruction and chaos, feeding on the anarchy it creates. The failure of a society is seen not in the emergence of the mob, but in the collusion between government and the mob. In 1780, the mob came close to pushing Britain into civil war. The anti-Catholic riots of that year set London ablaze and caused destruction in London’s poorest Irish neighborhood. From this riot came the famous epitaph “His Majesty King Mob,” a slogan one of the rioters scrawled on Newgate Prison, which the rioters destroyed. His Majesty King Mob reigned for barely a week. The unprepared government eventually called up 15,000 uniformed troops, who fired into the ranks of the mob, quickly quenching its thirst for violence and arson. In the Jim Crow South, the mob was an integral part of the subjugation of black Americans. As the social psychologist Hadley Cantril notes, elites organized, directed, and controlled lynch mobs that served to reinforce the boundaries of the racial caste system under the watchful eye of a colluding legal authority. Hitler’s Brownshirts grew out of Germany’s disgruntled veterans of World War I, the Freikorps. The Brownshirts were mobilized to precipitate mob-orchestrated chaos in the waning days of the Weimar Republic to undermine its fragile legitimacy and to enforce Hitler’s authoritarian rule as his party took power. The essence of fascism is the replacement of the state and its offices by the party. Government becomes an instrument of the party and a façade through which the external world deals with the party. The fascist state exists to serve the ideological interests of the party. In doing so, the state abrogates the social contract where people cede their use of violence to the state, and in response, the state is obligated to use its monopoly on violence fairly, judiciously, and without discrimination. Regrettably, this brings us to the recent events in Portland, Oregon, where fascism reared its ugly head. 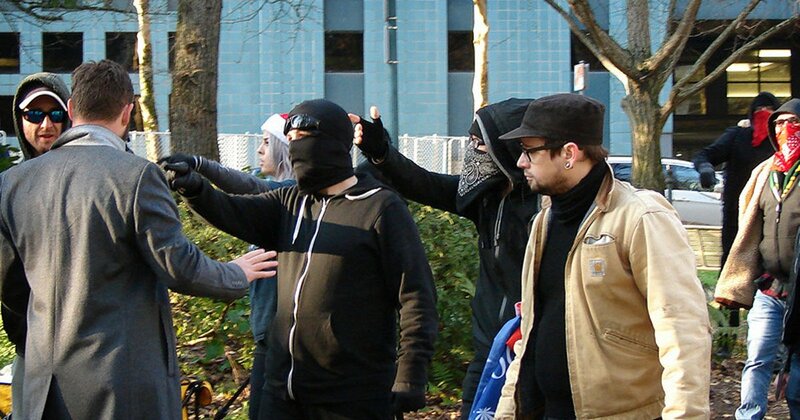 Mayor Ted Wheeler decided to side with the fascist mob, “Antifa,” against a legitimate law enforcement agency of the United States government that sought the protection of the Portland Police. The mayor, for clearly enunciated ideological reasons, refused to enforce the law he was sworn to uphold. He refused to protect the people who worked at the Immigration and Customs Enforcement (ICE) division of Homeland Security from a violent mob. The law became something to be selectively enforced for the promulgation of ideology in keeping with the Democratic Party’s new face that seeks the abolition of ICE. The refusal to protect people for ideological reasons is not at all different from the elimination of the legal status of the Jews under the Nuremberg laws, which denied Jews the status of “juridical person.” Having no legal protections, they were ripe to be victimized by Nazi thugs. Although comparisons with the Nazis are often overwrought and painted in hyperbole, there is no denying that when any group is denied protection of the law, it is made vulnerable to the thuggery of the mob. Whether the black communities of the Deep South in the era of segregation, the Jews of the Nazi era, or the ICE employees of Portland, the philosophical and legal implications are the same. These people are all denied the basic human right of protection under the legal system for which the social contract has been created. Designated as victims, they stand outside the law, and there are no consequences for their victimizers. The federal government should not have sent a handful of federal law enforcement officers to rescue the ICE employees. The government should have acted with the seriousness and severity that was required when Governor George C. Wallace stood in the doorway of the University of Alabama to defy the federal government. Mayor Wheeler’s act is as threatening to the foundations of the legal system and the social contract on which it is built as was any segregationist office-holder who ignored federal law. The Oregon National Guard should have been federalized, mobilized, and sent to Portland. Wheeler should have been detained. To have done anything less only encourages those who call upon His Majesty King Mob to do their bidding. A law-abiding society cannot survive on a foundation of mob rule, thuggery, and the non-enforcement of law when it serves ideological interests and not the common good. What happened in Portland is a failure of our legal and political systems. It cannot be permitted to continue unchallenged without giving legitimacy to continual episodes of local government-orchestrated mob violence. Abraham H. Miller is an emeritus professor of political science, University of Cincinnati, and a distinguished fellow with the Haym Salomon Center. This article originally appeared in The American Thinker and is reprinted by permission of the author.